You are here: Home / balanced / Is It Time For A Clean Sweep? I love the television show Clean Sweep. In the show the contents of a whole room are placed into a person’s driveway, and their things are sorted into piles: Keep, Maybe Keep, and Toss. One of the aspects I love about the show is the way junk is fretted over. Seriously, do you really want to keep those mismatched potholders, that torn and stained rug, or that Duran Duran cassette from 1987? If you have to ask, “What is this?” “Where does it go?” or “What does it do?” perhaps it should betossed. The truth is, maybe we need to look at our lives and schedule the same way we look at the clutter around our house in little piles or big stacks. 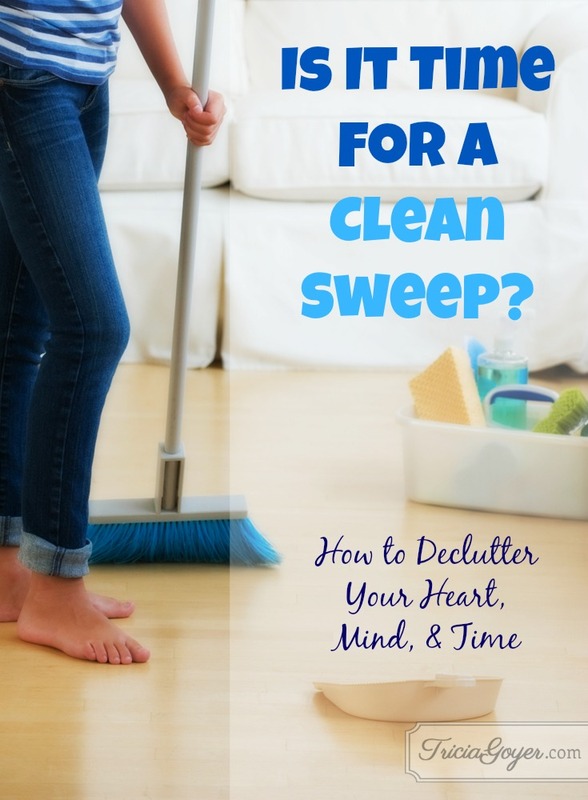 Do you have things cluttering your mind, heart, or time that need to be cleaned out? I remember one day when my husband encouraged me to do a clean sweep. A busy mom of two toddlers and one school-aged child, I was overwhelmed and exhausted by life. John could see it was taking a toll on me. When he asked me about my day, I muttered and moaned. I had a great husband, a budding career, and good kids . . . so why was I so frustrated? Because I was doing too many “important” things and I was exhausted. As I went over my schedule I realized everything, everything, ranked as a priority. I had given it all equal weight. The things I didn’t like took up just as much time as the things I found joy in . . . and soon the joy had become lost in the clutter. What things was I doing because I couldn’t say no? What things had worked for a season but no longer worked for our family? What things could I hand off to someone else? As I thought about my needs—and my kids’ needs—as I listened to my heart and my gut, I started making better decisions. Before I took on new responsibilities I considered whom I was most responsible for—my kids. My common sense grew, and I learned to think through why I wanted to do something and where it would fit. Once I started cutting things, I discovered I really cared about the things that were left! What things am I doing because I can’t say no? What things worked for a season but no longer work for our family? What things can I hand off to someone else? Then start cutting away. It’ll be hard, but it’ll be worth it. Not only will your schedule feel freer, but your heart will too. Guaranteed! Read this post and other great articles over at MomLifeToday.com! Are you a work-at-home mom raising kids, juggling a career and taking care of family responsibilities with only 24-hour days? Working at home while raising kids and juggling a career and family responsibilities is no easy feat. 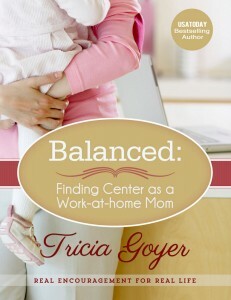 That’s why I wrote Balanced: Finding Center as a Work-at-Home Mom. Balancing is a process and a journey, one that I have yet to perfect. But between writing more than forty books, raising and homeschooling six kids, being a wife, and being active in my community, I have amassed valuable tips that I shared in Balanced. 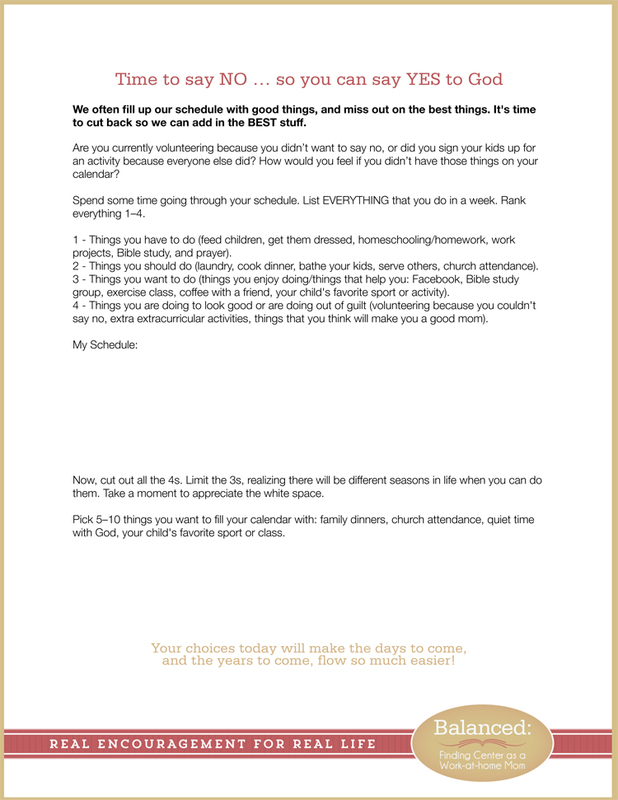 Download this FREE printable from Balanced to help you figure out what needs cutting in your calendar. I can completely relate with making everything on your To Do list an equal priority. I struggle so much with that. I guess I feel like there’s so much I WANT to do and not nearly enough time to do it all, that I just strive to do it all anyone. Sort of the “throw it all against the wall and see what sticks” method. Unfortunately, not much sticks because the quality of what I’m throwing is never at it’s best. That’s the trade off. I was just thinking today that I need to take my gazillion writing ideas in my task list and narrow them down to one or two tasks per day. Otherwise I spend all my time rushing through a project just trying to get it done so I can put that checkmark next to it on the list. The result is the quality of the completed task suffers and ten other projects get pushed to the next day anyway. It’s too stressful and I end up spending too many hours “working” and not enough time enjoying life and the people God blessed into it. Great suggestions! Sometimes is just important to sit down and ask yourself questions and think before you do something! It is pretty helpful! Thanks! Greets, Homerton Carpet Cleaners Ltd.
Great read! Decluttering your mind is something really important and the idea to sit and think about all these things is really good Thanks for the post!